The Arsenal finally comes out of hyperspace at a lush green moon of a planet named Archland. The ship settles down outside an old stone structure. Oh is quickly ushered inside and the scouting reports are then distributed with Mozeliak and others cloistered to discuss and analyze them. Finally, the braintrust emerges and calls a team-wide meeting. All pilots and other support personnel meet in the center of the base. The battle station is heavily shielded and carries a firepower unseen since the Yankee Battalion of ‘27. Its defense is designed a large-scale assault. A small, one-man fighter should be able to create some errors in that defense. Pardon me for asking, sir, but what good is small ball going to be against that? The Empire doesn’t consider it to be a threat or they’d have a tighter defense. An analysis of the scouting reports provided by General Manager Mozeliak has demonstrated a weakness in the battle station. Oh-two, also in the room, projects a schematic of the Series Winner as detailed by the scouting reports. The approach will not be easy. You are required to maneuver straight down this trench and skim the surface to this point. The target area is only 17 inches across. It’s a small thermal exhaust port for all the hot air that comes from the Empire’s supporters. The shaft leads directly to the reactor system. A precise hit will start a chain reaction which should destroy the station. Only a precise hit will set up a chain reaction. The shaft is ray-shielded so you’ll have to use photon torpedoes. The room buzzes with this information as pilots start talking among themselves. That’s impossible, even for those computer types. It’s not impossible. I used to knock over those large action figures with stones back home. They weren’t much bigger than 17 inches. Then man your ships. And may Command be with you. As the pilots head out to their ships, out in space the Series Winner starts to close in on the Republic base. Rizzo and Maddon keep watch. Orbiting the planet at maximum velocity. The moon with the Republic base will be in range in thirty minutes. Holy cow. This will be a day long remembered. 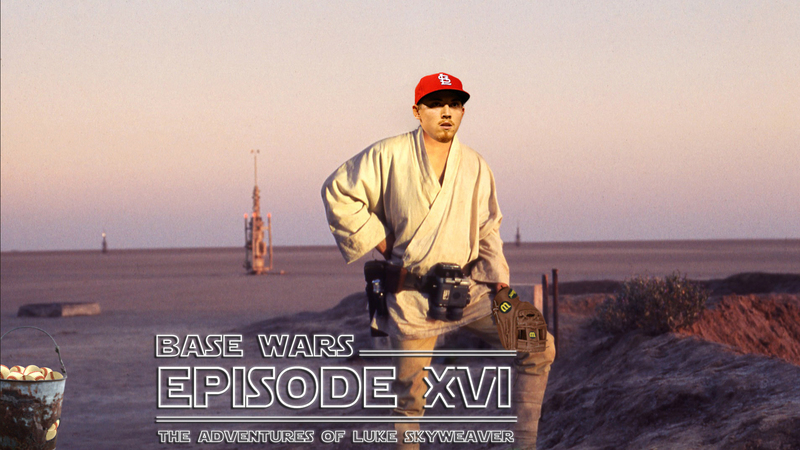 It has seen the end of Carpenter and will soon see the end of The Cardinal Way. Did you know that Republic spelled backwards is Cilbuper? Back at the Republic base, pilots are scurrying everywhere and support crew are prepping fighters for battle. Luke comes across Reyes and Kelly, who are packing up to leave. So, you just got your reward and are leaving then? That’s right, yeah! I’ve got some old agent fees I’ve got to pay off with this stuff. Even if I didn’t, you don’t think I’d be fool enough to stick around here, do you? Why don’t you come with us? You’re pretty good in a contest. I could use you. Come on! Take a look around! You know what’s about to happen, you know what they are up against. They could use an incredible talent like you. You’re turning your back on them. What good is a prospect ranking if you aren’t around to use it? Besides, attacking that battle station isn’t my idea of courage. More like humiliation. Well, take care of yourself. I guess that’s what you’re best at. (softening) Luke…may Command be with you. Luke nods, then takes off for his ship. Kelly growls a question at Reyes. What’re you looking at? I know what I’m doing. As Luke heads for his ship, he’s stopped by an old friend. Luke! I don’t believe it. How’d you get here? Are you going up with us? Sam! Of course, I’ll be right up there with you. Listen, I’ve got some stories to tell…. I’ve got to get aboard. Tell me your stories when we get back, OK? I told you I’d make it someday! You did all right. We’re a couple of shooting starts. We’ll never be stopped. Tuivailala climbs into his fighter while Luke heads farther down the row to his ship. As he approaches, he sees Oh being lifted into the droid slot. This O2 unit of yours seems a bit beat up. Do you want a new one? Not on your life! That little guy and I have been through a lot together. You OK, Oh-two? As Oh is lowered into the ship, he affirmatively acknowledges. Luke climbs into the cockpit and makes the necessary adjustments to prep the ship for takeoff. As the ships start to line up for takeoff, Luke hears something. Luke, Command will be with you. The ships head out of the Republic base and race toward space. Inside the base, Mozeliak, Oquendo, Eugene, and other Republic figures crowd around displays charting where everyone is positioned for the coming battle. We’ve got a hot one now. The Series Winner’s gonna be in range in 15 minutes. I wish you folks out in space could see this moon. Out in the blackness of space, the ships break off into squadrons. Lock S-foils in game face position. The ships adjust their wings and fly in formation toward the Series Winner. As they close in, Wainwright continues to give instructions. Switch your deflectors on. Don’t let anything get past you. The Series Winner continues to grow as they get closer and closer to the surface of it. Cut the chatter, Red Two. Besides, that just makes for a bigger strike zone. Accelerate to attack speed. It’s game time! We’re starting for the target zone now. Wainwright looks around and sees the two Gold fighters moving around. Wainwright adjusts his targeting device. We’re in position. I’m going to try to draw their fire. The fighters dive for the surface of the Series Winner. Laserbolts flash from both sides, as the Republic tries to chip into the huge structure while the Empire tries to defend their home turf. 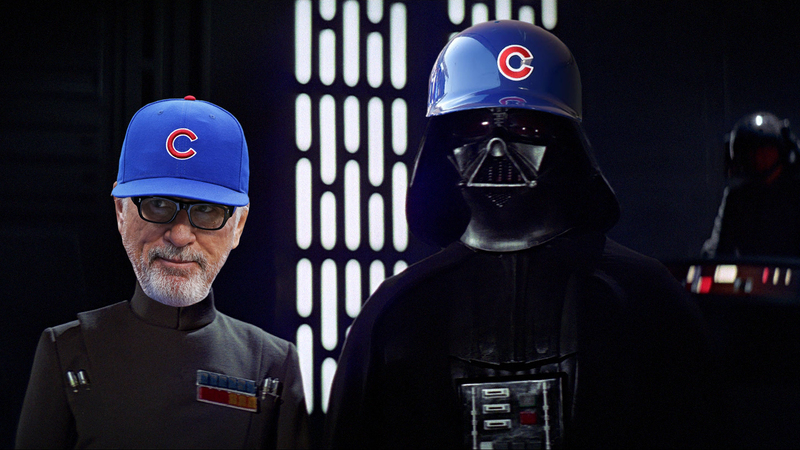 Back in the Republic base, Mozeliak and company listen in to the communication between ships. Heavy fire, boss! Seventeen degrees. We shift to Luke’s cockpit. He starts to dive toward the Series Winner. This is Red Five, I’m going in. Luke heads toward the surface, but then gets strafed by Imperial firepower. He realizes he’s bitten off more than he can chew and could be roasted here. Luke comes straight through the fireball, with his ship a little worse for wear. I got a little cooked but I’m OK.
As the ships continue to peck away at the Series Winner, we move inside of the station to see the damage being done. Walls explode and troopers are knocked over. A fighter pilot approaches Darth Rizzo. We count forty Republic ships, Lord Rizzo. But they are so small they are avoiding our turbo-lasers! Previous Post: UCB Roundtable: What One Move Would You Make?